PlusOption, the Market Leading Binary Options Broker! With such a wide choice of binary options brokers now available to traders, spending the time to research the different trading platforms and the companies behind them can be a mammoth task. However, feeling confident that a binary options broker will provide a top quality product, service and safe custody of trading account funds is important before opening an account and depositing hard earn cash into it. That’s why we’ve tried to save binary options traders, beginners and the more experienced alike, some time. We’ve put together the crucial information you need to know, such as trading platform qualities and features, deposit and withdrawal details and company background on a huge range of brokers. Instead of digging around a broker’s site to find out what fees and charges may be applicable, what the range of tradable assets is and what value of minimum deposit is required just read through our reviews where all the information you need is conveniently compiled in one place! In this review, we cover PlusOption. There is not a great deal of company information available on the PlusOption website. However, the broker has been around since 2014 and is owned and operated by parent company Redfield Markets Ltd, which is registered in and operates out of Sofia, Bulgaria. Payment services are run by ACV Operations of Romania and the company also has a UK-based customer service telephone number. The company’s website states that client funds are held in a segregated account, separate from the broker’s operational accounts, providing an additional layer of security for traders. PlusOption’s trading platform is a white label version of the market leading SpotOption software, that many of the industry’s biggest brokers rely upon. 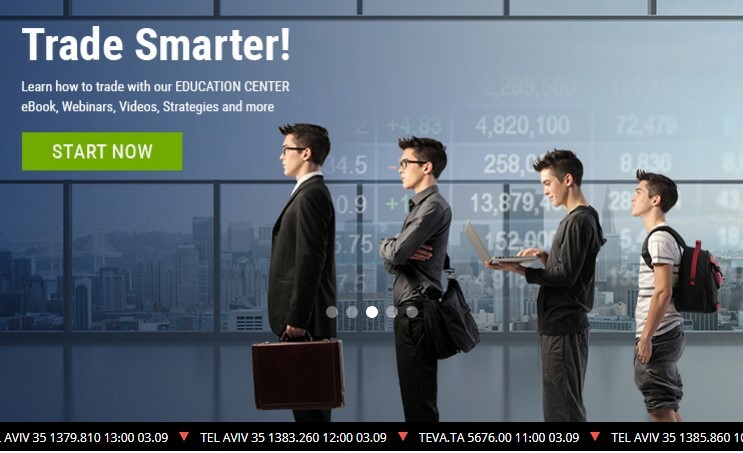 It’s the most popular binary options trading platform and around 40% of binary options traders use it. SpotOption’s binary options trading software standard can be compared to MetaTrader’s market position in the CFDs and forex trading market. SpotOption’s trading platform is not the market leader by chance and provides intuitive usability, simple navigation and a full range of binary options formats in addition to classic options. Long Term and 60 Sec options have the same general format but with longer 1 day to 3 months and turbo trading 60 second expiries respectively. One Touch options expire in the money if the strike price is reached at any point before the option’s expiry, regardless of finishing level and Ladder options tier strike prices with the payout increasing depending upon how far up or down the ladder the price has moved by the option’s expiry. Pairs are binary options that are based on the relationship between two distinct assets, for example Apple and Facebook stocks, and Spot Follow is a social trading functionality that allows traders to copy trade peers. The platform is browser-based so can be accessed from any device that supports a browser and is connected to the internet. 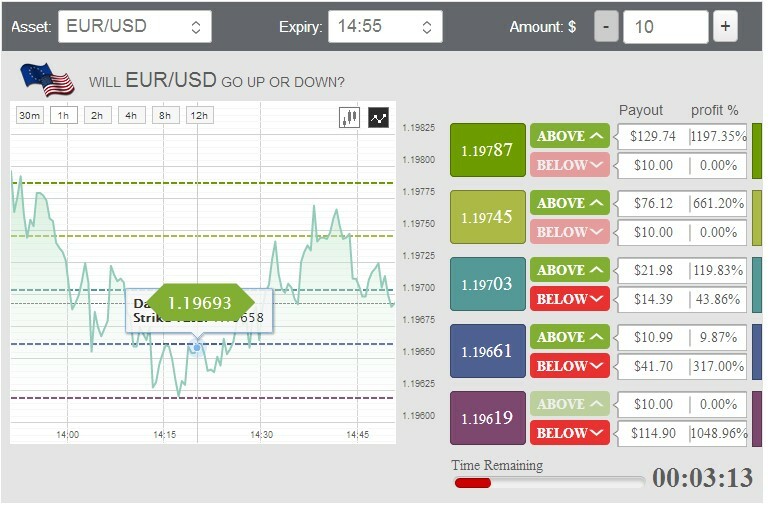 iOS and Android mobile apps also allow traders to use PlusOption on the go for additional flexibility. The full range of functionality the desktop/laptop trading platform offers is preserved in the app-based version and deposits and withdrawals can also be conveniently made. Well over 100 different assets can be traded with PlusOption, across forex, commodities, stocks and indices asset classes. Over 20 forex pairs are included in the tradable assets index, with Bitcoin also available. 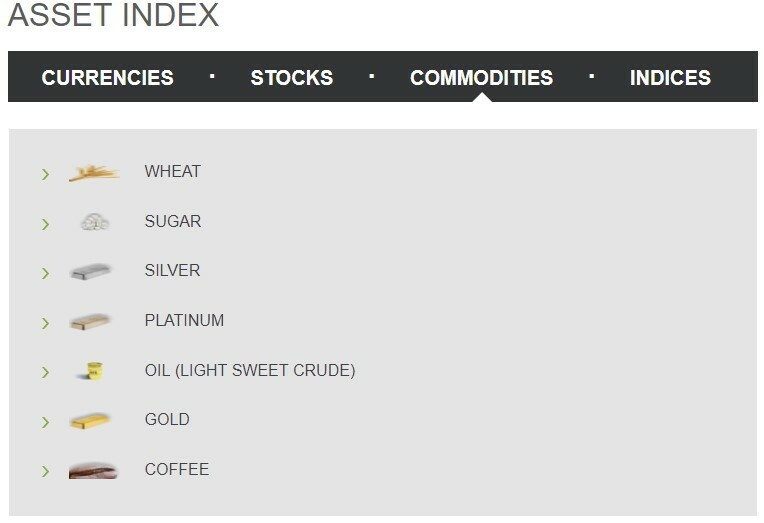 Commodities include the major precious metals, oil and even three ‘soft’ agriculture commodities in wheat, sugar and coffee. The range available in the stocks and indices asset classes is a particular strength with companies from Europe, Russia, Japan, Hong Kong and India all available as well as equities indices from a variety of geographies such as the Middle East and India. We’ve already mentioned the range of alternative binary options formats that can be traded on PlusOption’s SpotOption-powered platform. Four different levels of account are also provided based upon the value of initial or subsequent deposits made to a trading account. 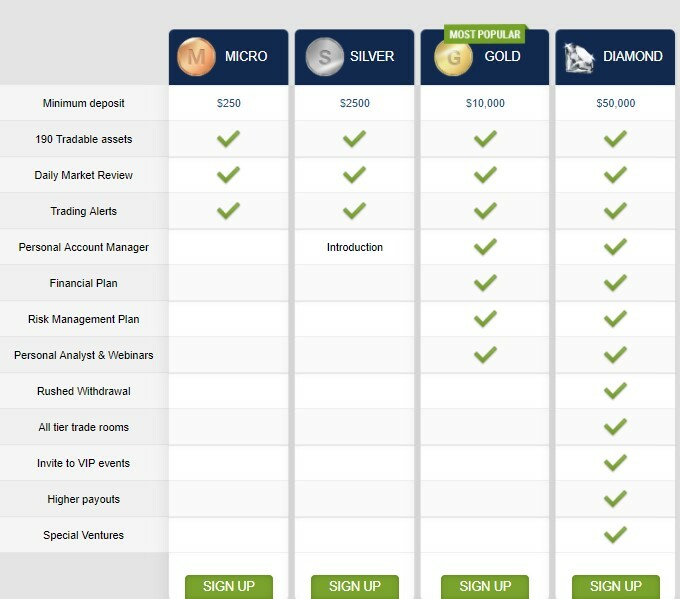 Gold and Diamond accounts, given to clients who deposit at least $10,000 or $50,000 respectively come with various value-added extras such as education plans and higher payout percentages for winning trades. There are no fees attached to trading services or to open an account. A fee of $25 is applied for withdrawals if processed by wire transfer. Dormant accounts, qualified as accounts which have seen no trading activity for at least 45 days, are charged an administration fee of $49.9, or £/€ if the base currency, per month of inactivity until the account is closed by the trader. The account is automatically closed if it contains insufficient funds to meet the inactivity fee. As with all SpotOption-powered trading platforms, payouts on standard binary options reach 85% as standard but can reach up to 1000% in the case of specific Ladder binary options. PlusOption occasionally offers new and existing clients top-up cash bonuses to the value of deposits made into a trading account. However, there is not currently any concrete information available onsite regarding bonuses. The company’s bonus policy states that any bonuses awarded must see x30 trade turnover on the value of the bonus before traders are able to withdraw it as cash. 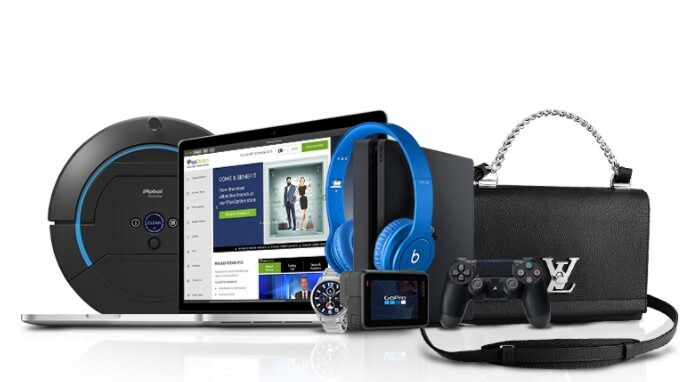 The broker also offers a ‘Loyalty Gift Shop’ where traders can choose from a range of gifts such as tech and fashion accessories. However, not concrete information on what qualifies traders for these gifts is provided. Deposits and withdrawals into and from a PlusOption trading account via Wire Transfer, Visa, Maestro and Mastercard debit and credit cards and a range of e-payment processors including Skrill, WebMoney and Yandex Money. Proof of identity and residency must be provided as part of anti-money laundering procedure. The minimum deposit amount facilitated is a low $100 and the maximum deposit that can be made through any single transaction is $5000. If the account has a base currency in £ or €, the minimum and maximum deposits are £/€100 and £/€5000. Minimum withdrawal value is set at $/£/€100. Withdrawals to credit cards cannot exceed the value of the deposit made from the same credit card. Customer support is provided by either email or telephone with UK and South African telephone numbers provided. Support working hours are Monday to Thursday 08:00 to 17:00 and Friday 08:00 to 13:00. PlusOption provides a trading ‘Academy’ with e-books, courses and video tutorials aimed at traders with a range of experience from beginners to advanced. A daily market review is also a handy additional resource as is a blog section with a good range of general interest binary options themes, topics and guides. When it comes to the binary options trading experience itself, PlusOption doesn’t do much wrong. The SpotOption-powered trading platform is top quality and easy to use, provides a great choice of tradable instruments and alternative binary options formats to keep things interesting. The educational resources and market research is also of good quality. While this broker is not regulated it has been around for a number of years and operations are based in the EU, with the company also stating that client funds are kept in segregated accounts. What is the minimum deposit required by PlusOption? How many assets are available to trade? How can I make a withdrawal from a PlusOption trading account? As long as all personal identification documents required have been provided, and bonus turnover conditions met where applicable, account holders can make a withdrawal whenever they wish via either wire bank transfer or to a credit card or e-wallet provided by supported companies.